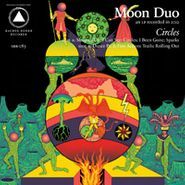 Zoom off on a kozmic desert trip with Moon Duo! Circles, the third album from this side project of the great Wooden Shjips' guitartst Eric Ripley Johnson, is a garage/kraut/bubblegum blast, full of crunchy riffs, whipcrack motorik rhythms and zoney space howlin'. Not to mention the Shjipsy predilection for endless Suicide-al rep rep repetition. Hot shizzzzz!! !